As we know, Discord is a really popular voice and text chat application made especially for gamers. Nobody else but a gamer, knows how crucial it is, to communicate with other team members to have a successful game strategy. Some games allow the users to communicate with their team via an inbuilt application in the app, whereas, some games don’t allow this facility for gamers. This is where Discord comes to the rescue. Players can use Discord to chat with other team members, by using voice or by typing. The best part is, It is free. It is multi-platform enabled, and one can stay connected via their desktop and even on their mobile devices. If you already know about Discord, then you probably are aware of the functionalities that Discord offers to its users. 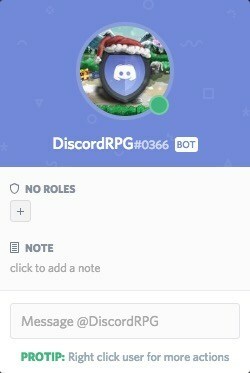 This is where the flexibility of discord comes in; players can customize their Discord servers by using bots as Discord has enabled bot support. In case If you’re wondering how to, we’ve curated a list of best discord bots in this post. This bot is specially designed for the players who play overwatch. 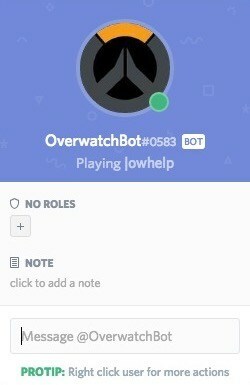 This bot lets you do many things related to overwatch. It has specific functionalities which allow you to watch your overwatch statistics without you leaving your server. This bot enables the user to view top heroes and presents the stats in a proper image format. 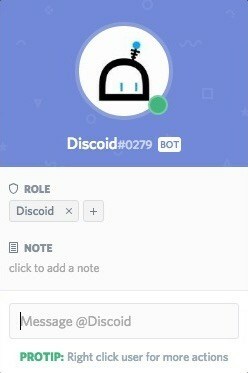 Discoid continues to be one of the most popularly used chat bots for Discord servers. It enhances the user experience by offering various cool features. A discoid user can mute other team members, get notified of your stats and others stats. It also comes with special commands for sharing jokes and memes among friends. One can control the media playback on Youtube and SoundCloud. Simply, queue all the songs and the Discoid Bot shall take care of the rest. 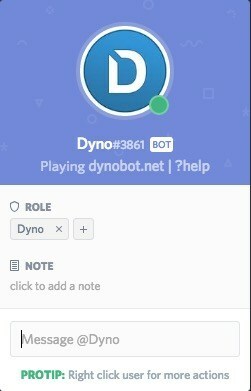 Dyno is a bot, known for its extreme customizability. First up, the user gets a fully customizable dashboard, which he can change as he wishes. One can also create announcements on the server, and provide special alerts when someone new joins the server or gets kicked off the server. Dyno too offers mute feature and allows setting up of timed mutes and player bans. Dyno is clever, so your inbox is going to be spam free, thanks to its inbuilt spam filter which keeps all the spam and the junk away from you. As far as media streaming is concerned, the Dyno bot supports streaming from Youtube but not SoundCloud. Have you ever been bored by the game you’re presently playing? Or a team member is left behind, and you’ve been waiting for him since ages? Then Discord Dungeons is for you! How about a game inside a game chat client? It sounds fun! Well, that’s what Discord Dungeons is. The game is fully developed, and one can fight enemies and unlock various achievements in the game. You can also play as a team in this. It is a whole lot fun! Add this Bot to your Discord server today and never be bored again. The game is playable on all platforms where Discord works. This means that the game is also playable on mobile devices too. 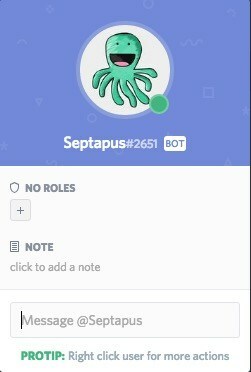 Septapus is another interesting Bot for Discord. It allows the users to chat, just like any other bot, but it has got a twist to it. How long can a team just be chatting and sharing details? This is where Septapus spices up the things. It entertains the players with comics and charts which will add a bit of fun to your server. Also, for Youtube gamers, It allows viewing stats and notifications, making your job much easier. Love Music Bots? Well, Vexera is one of the best Music Bots for Discord that you should definitly try. The bot comes with a clean interface for the Music Playback. You are able to control the music queue either in-channel or via the web panel. Vexera also allows you to easily control the server by features like Ban, Kick, Role, vckick, clean, mute and softban. Then there are features like greetings and farewell. 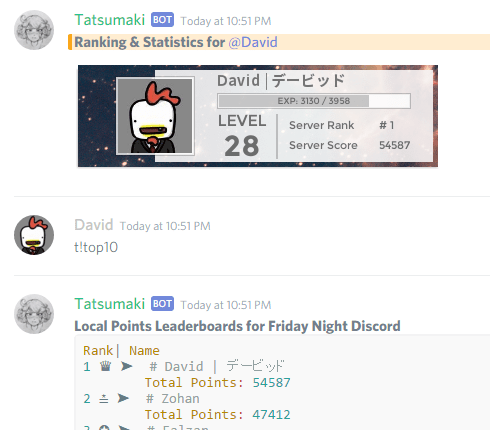 Tatsumaki is one of the best Discord Bots which is focused on increasing the chat activity of the users on Discord servers and also providing some interactive and fun tools. The features include Welcome messages, notifications and some more interesting things that make the overall experience great. In fact, almost every Discord user will agree that it is one of the best Discord Bots out there. There is a dedicated dashboard from where you can change the settings of the bot and so, it is not just limited to the Discord. XP, Levels, and Reputations are also the features of this Bot that help in increasing the activeness of the users since they are really engaging. The reputation system lets members upvote another member of their choice. Finally, there are RSS feeds as well that is one more impressive feature of this bot. Many consider this to be the best Discord bot in the world. You have the freedom to customize almost everything that this bot offers. From simple text to an embedded message having impressive content, you can customize anything you want with this bot. 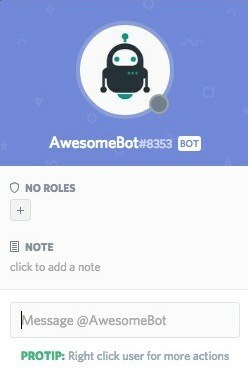 Anthbot offers notifications with which you can connect a Facebook page and receive post updates to a Discord channel. The same is for other social networks like Twitter, Reddit, Twitch & YouTube. But this is not everything, you can do the reverse thing, and every post from a Discord channel goes to social networks or services like Telegram. There are other features like economy/experience system that lets you improve your rank. 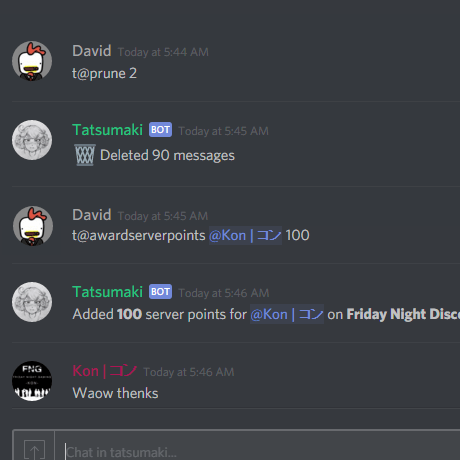 There is much more that this impressive discord bot offers and you should definitely check this out. Want the best music experience on Discord? Well, Rythm is here for you. This impressive discord bot is just for one particular thing, i.e., to have the best music experience on Discord. 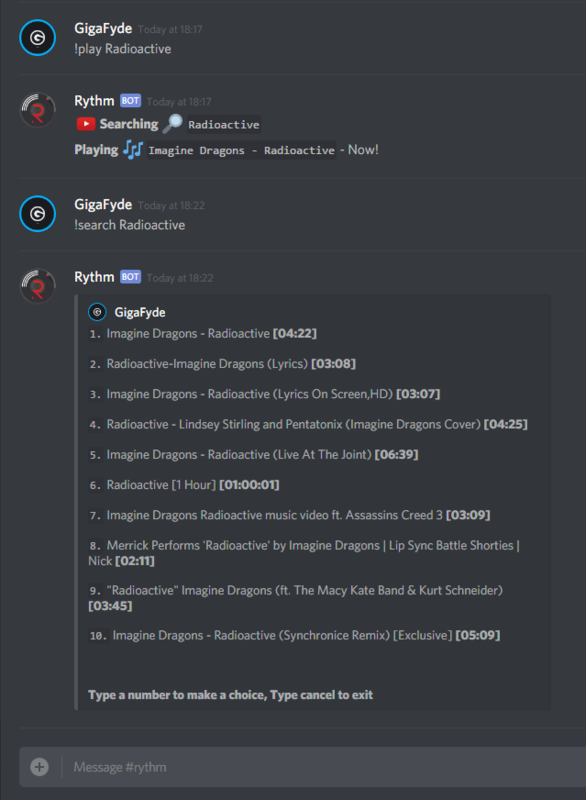 Unlike other discord bots that claim to do the same thing, Rythm is different because it delivers music from not just one source but multiple sources and is regularly updated. This bot offers no music lag whatsoever. The music can be played from sources like YouTube, Soundcloud, Twitch and more. The bot is serving more than 1.8M discord servers at the moment which shows how much popular it is. Some features of this bot include Auto Play, Server Prefix, Lyrics, Play and Search, Playlists and more. There are so many other bots which aren’t mentioned in this list. These were some of the best discord bots which we found it worth mentioning. This is the beauty of Discord, as unlike other chat clients, Discord is free and allows full customization by enabling the use of bots. Liked this list or Have any suggestions? Do let us know via the comments section. Have a Good Day. If you’re a gamer, Guilded Bot is a must, too. I’ve been using it to recruit members for my guild and push them our raid schedule to the discord server. I use it in conjunction with Dyno all the time. Highly recommended.